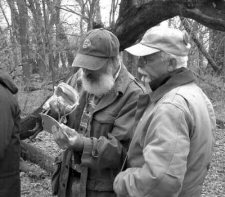 In April 2003, PIT volunteers came from across the Midwest to investigate 19th-century farmsteads at Midewin National Tallgrass Prairie. The Mighty Acorns Program, a land-stewardship program for youth emphasizing environmental conservation, piggybacked this year’s PIT project at the Kelly Farmstead. Vacated after the U.S. Army purchased the land in 1940, the Kelly Farmstead is located in a heavily wooded area that eventually will be thinned out. Afterward, shade beds for the production of native prairie savanna plant seeds will be set up. The entire site must be mapped, recorded, and evaluated prior to the commencement of restoration activities. The Mighty Acorns worked alongside the skilled PIT volunteers with FS Archaeologists Mike Rizo and Mary McCorvie, who co-hosted the project. Usually at this timeof year, the students participating in the Mighty Acorns Program pull non-native garlic mustard to prevent the spread of this invasive species at Midewin. Because of dry conditions this past spring, the plants were not yet sprouting, so the students had an opportunity to tackle a project unfamiliar to them, assisting the PIT volunteers in clearing overgrown vegetation to expose various features at the historical-period farmstead. The students also assisted in test excavations and screened for artifacts. 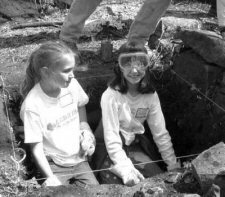 The volunteers acted as instructors and mentors, and the youth learned about archaeology and the need for preserving important archaeological sites. Many of the volunteers grew up on farms, and were able to offer their muchappreciated insight into the function of artifacts and building foundations. An unexpected event during this year’s project occurred on the first day when heavy winds blew a prescribed burn on state property adjacent to Midewin onto FS land where it quickly became a wildfire! The PIT volunteers and Mighty Acorns had to be evacuated from the area. While no one was in immediate danger, the smoke was readily visible, and the fire burned approximately 300 acres of grassland within a mile of the project area. Firefighters extinguished the fire that night, and archaeological work continued the following day. The project was rained out on the fourth day, and the Mighty Acorns went on to other endeavors. However, this inconvenience did not put a damper on the project! The foul weather offered the PIT volunteers an opportunity to explore the cultural heritage of the area surrounding Midewin. Since the project focused on 19th-century Will County, the volunteers explored notable historical sites in the area, such as the remains of the Joliet Iron Works and the Illinois and Michigan (I&M) Canal, both of which were crucial to the development of the local economy during the mid-1800s. Dr. Dennis Cremin, a historian with the National Trust for Historic Preservation, led a special tour of the Gaylord Building, a National Historic Trust Site on the I&M Canal once used for storage and as a brokerage house. Finally, everyone visited the Illinois State Museum Gallery at Lockport and saw an exhibit of original Audubon prints illustrating Illinois bird life. All in all, the project was a huge success in spite of, and in part because of, the unanticipated events that added both excitement and new learning opportunities to the exploration of historical-period farmsteads. The PIT volunteers generously shared their knowledge and experiences with the Mighty Acorns, and the youth were, in turn, excited to learn about archaeology and history. Teaming the PIT volunteers with the youth of the Mighty Acorns Program was a positive step in supporting Midewin’s vision of providing a gift for future generations!